Konark Sun Temple is a 13th century Sun Temple (also known as the Black Pagoda),at Konark, in Odisha. 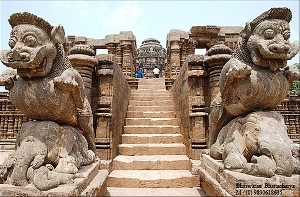 It was constructed from oxidized and weathered ferruginous sandstone by King Narasimhadeva. The temple is an example of Odisha architecture of the Ganga dynasty. The temple is one of the most renowned temples in India and is a World Heritage Site. It is one of the Seven Wonders of India. Legend has it that the temple was constructed by Samba, the son of Lord Krishna. It is said that Samba was afflicted by leprosy, brought about by his father’s curse on him. After 12 years of penance, he was cured by Surya, the Sun God, in whose honour he built the magnificent Konark Sun Temple. The Sun Temple, built in the thirteenth century, was conceived as a gigantic chariot of the Sun God, with twelve pairs of exquisitely ornamented wheels pulled by seven horses. Majestic in conception, this temple is one of the most sublime monuments of India, famous as much for its imposing dimensions and faultless proportions as for the harmonious integration of architectural grandeur with plastic allegiance. Every inch of the temple is covered with sculpture of an unsurpassed beauty and grace, in tableaux and freestanding pieces ranging from the monumental to the miniature. The subject matter is fascinating. Thousands of images include deities, celestial and human musicians, dancers, lovers, and myriad scenes of courtly life, ranging from hunts and military battles to the pleasures of courtly relaxation. These are interspersed with birds, animals (close to two thousand charming and lively elephants march around the base of the main temple alone), mythological creatures, and a wealth of intricate botanical and geometrical decorative designs. The famous jewel-like quality of Odisha art is evident throughout, as is a very human perspective which makes the sculpture extremely accessible.